We’re gonna party like it’s 1989 too, Taylor Nation. In case you don’t know, you can watch z100’s Jingle Ball 2014 right now through Yahoo! Live / iHeartRadio. Here at the Swift Agency, just a guy who’s glad Taylor got this award from none other than a fan just like you and me, we want to congratulate Taylor in her second win of the Billboard Woman of the Year award. The award was presented by an actual citizen of the Taylor Nation, @GenaGabrielle! Woot. She also didn’t forget about the young upcoming artists after her. The full speech is on Billboard. The Sparkly Dressed also got a birthday serenade by the one and only Icon of the Year, Aretha Franklin. 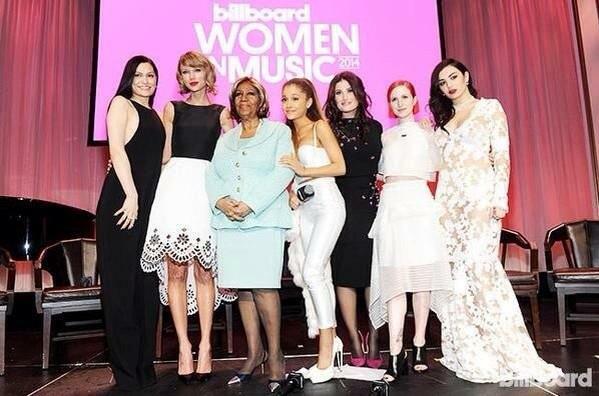 Also honored at the event were Jesse J, Aretha Franklin, Ariana Grande, Idina Menzel, Haley Williams and Charli XCX. The very impressive Ingrid Michaelson covered Taylor Swift’s song Clean during the ceremony. I also wanted to highlight Gena’s introduction of Taylor which was brilliant! “I’ve been fortunate to share in her transformation,” Gena said before introducing her. “Her ability to write and perform is incredible, but it’s her impact beyond music where she really shines…I found Taylor because of her music, but I stayed because of her character.” You can read the full story on Billboard. Taylor will be at z100’s Jingle Ball 2014 in New York City, New York on December 12. She headlines New Year’s Rockin’ Eve with Ryan Seacrest on December 31. December 13: 25 Candles: Taylor Swift’s MTV Moments. Previous Previous post: Tour Talk & News Update: Changes for St. Louis. New concert for Houston. Barbara Walter previews & Incredible Things!